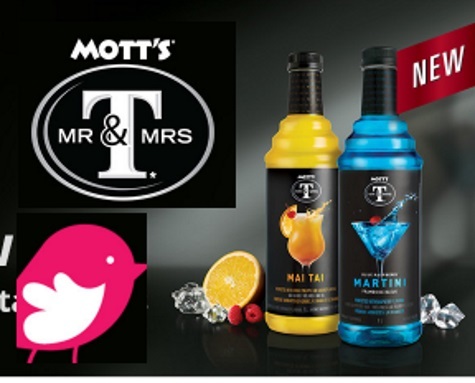 Exciting news; Mott's* Mr & Mrs T* has a range of cocktail mixes to elevate the at-home cocktail experience. Bring out your inner mixologist and use Mr & Mrs T at your next social gathering to create enjoyable cocktails (or mocktails). They are offered in 5 delicious flavours, including NEW: Mott's* Mr & Mrs T* Mai Tai Cocktail Mix Mott's* Mr & Mrs T* Blue Raspberry Martini Cocktail Mix. Interested in being one of 200 lucky Product Review Club members who will try BOTH of these cocktail mixes? Click on the link below before May 22, 2017 to apply! Offer open to Canadian residents only. Selected members will be contacted by email the week of May 23, 2017. Not a Chickadvisor Product Review Club member yet? Click here it's free to join, then write at least 5 product reviews to qualify for future testing campaigns.